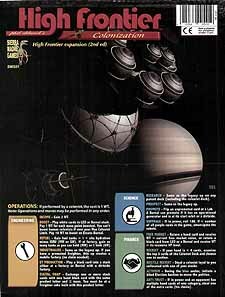 High Frontier Colonization, is the 2nd edition expansion to both the first and second editions of High Frontier. Multiple spacecraft (Rocket, Bernal, Freighter, and mobile factories). Gigawatt thrusters 100X more powerful than the legacy megawatt thrusters. Multiple Outposts (up to two). Multiple Products from each factory (using an assumed 3D printer capacity). Multiple Operations (one per colonist), with a variable order of play. Freighters that carry multiple products plus a 3D printer for making replacement parts. 12-year sunspot cycle with biennial events. Triangle burns "inspire" rather than generate events. Expansion Map extended out to the inner Oort Belt at 550 AU. "Werner's Star" solitaire variant (2-hours playing time). The thriving space infrastructure has hundreds of specialists working in space colonies orbiting Earth. These provide services such as antimatter manufacture, solar power beams, cycler satellites, space telescopes, the space elevator, and of course, the local tax office. But new mining and space manufacturing opportunities have arisen further afield in the High Frontier. These are reflected in new Bernal, colonist, and freighter modules allowing players to move their base of operations. The freighter and gigawatt thruster modules include new paths to victory called Futures, available if you promote the card.